Toronto FC forward Jozy Altidore battles for the ball with Laurent Ciman during the first leg of the MLS Eastern Conference final at the Olympic Stadium in Montreal on Nov. 22, 2016. 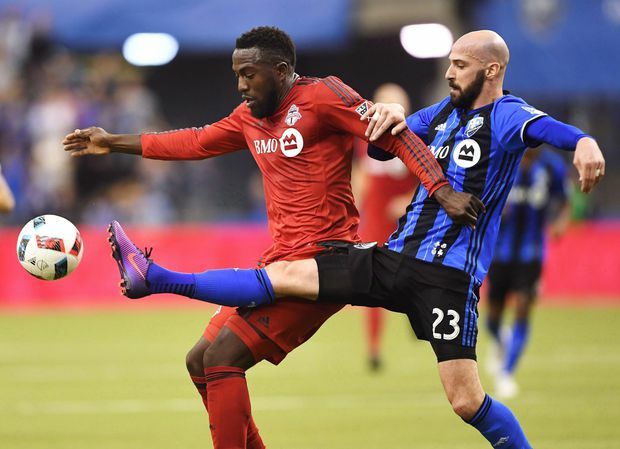 Toronto FC defender Laurent Ciman says while he has nothing but respect for his former team in Montreal as well as its fans, he wears red now. And the Belgian international said while he understands the rivalry between the two Canadian clubs, playing Montreal will be a match like every other for him. Ciman, 33, joined the Impact from Belgian club Standard Liege in 2015 because Montreal offered better treatment than he could get at home for his daughter Nina who has autism spectrum disorder. Ciman bought a house in the city and was disappointed when he was traded to expansion Los Angeles FC in December, 2017, after 85 regular-season games with the Impact. He left LAFC – and coach Bob Bradley, father of Toronto FC captain Michael Bradley – last August to join French side Dijon. Ciman has been brought in to bolster a Toronto defence that gave up a franchise-worst 64 goals in 2018. Toronto coach Greg Vanney prizes Ciman for his ability to move the ball out of defence.